You are here: Home / Cyber Deals / Thanksgiving Day Sale: 50% Off iPhone Cases! Thanksgiving Day Sale: 50% Off iPhone Cases! Just in time for the Holidays, Tiny Prints is offering 50% off iPhone cases! When: Thanksgiving Day until 11:59pm PT. Offer expires 11/28/13 at 11:59 pm (PT). Save 50% off customer photo iPhone cases using the code IPHONE50 at checkout. There is no minimum purchase required for this promotion. 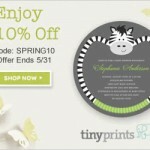 Offer is only valid on Tiny Prints and is not applicable on treat.com, third party or partner websites. To prevent abuse, we reserve the right to discontinue or modify this offer at any time without notice. We reserve the right to cancel any order at any time. Disclaimer: The information and banners were provided courtesy of Tiny Prints. The above links are provided courtesy of an affiliate program. A small portion of the sales generated by clicking these affiliate links will help Tickles & Tots cover any costs associated with running this site. Thanksgiving Sitewide Sale: 25% off Any Order! 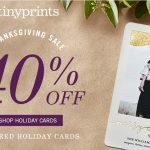 Black Friday and Cyber Monday Deals at Tiny Prints! 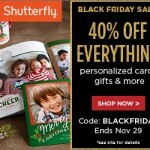 « Thanksgiving Sitewide Sale: 25% off Any Order!